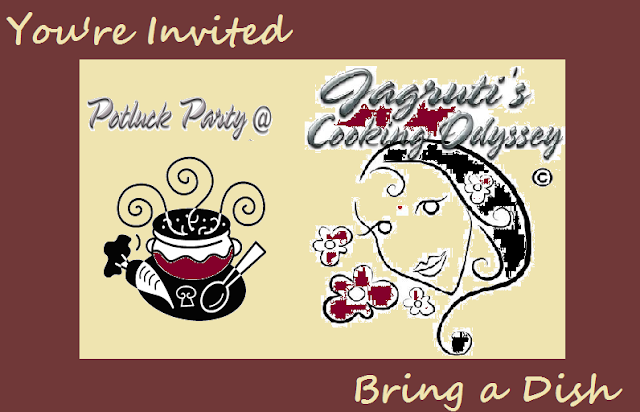 Jagruti's Cooking Odyssey: Potluck party, Cyber style! - Fun and the Challenge ! ! Potluck party, Cyber style! - Fun and the Challenge ! ! Birthday, Anniversaries, house warming ...everyone loves a good party ! Whether you are looking to get your groove on, meet new people or just catch up with old ones, parties are always somewhere on our diaries. The one thing that a party will never be complete without is good food. Unfortunately, it's true that the food can make or break your party so you sure want to get it right! We have cooked and shared our dishes with each other and ended up making those dishes in our kitchen too. Ok, so that's all fair and well but how exactly are bloggers across all continents going to meet up to share their recipes? 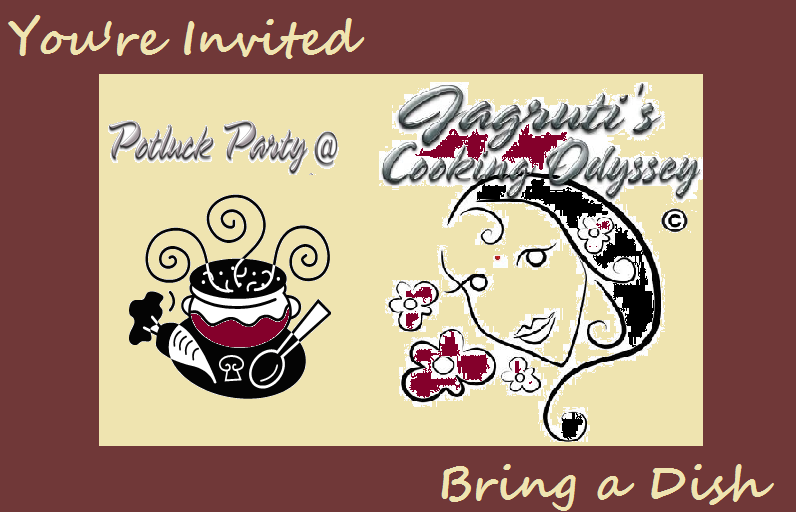 A thought came to my mind and also struck me it would bring joy and fun to host a Potluck Party, Cyber Style in the blogging world @ Jagruti's Cooking Odyssey ! But what exactly are potluck parties? A potluck is a gathering of people where each person or group of people may contribute a dish of food prepared by the person or the group of people, to be shared among the group. A potluck party is a brilliant way to make everyone who attends the party to be the host. Never again is there going to be a time where fussy eaters can't find anything to eat! I know that still you are scratching your head. How can we host a Potluck party in the Cyber world ? Answer is very easy.......Check out the guidelines ! JCO is proudly hosting a cyber pot luck party where every blogger is Invited to Bring a dish every month to make new blogger friends, try their dishes and expose your blogs into the cyber world to bring more traffic ! The vegetarian dishes can range from starters, mains, desserts and drinks, your own or from a cookery book, cooked and posted on your blog and link on my blog on the 10th of every month. Sound so easy doesn't it ? So much Fun right? well I won't let you go that easily..:) here comes the CHALLENGE ! I will put all the participaents in four group A,B,C,D in Facebook Group. After posting your own recipes on 10th every month, you will be cooking other participants dish and post on 28th of same month. You won't be paired with anyone, If you're in Group A first cook from A group, when finish with your group A Start from Group B.
Cook the same recipe which they have cooked and posted for Potluck Party, only this way you can taste their dish. First month if you've cooked starter, next moth cook mains, dessert or drinks. So always you cook and bring something diffrent to the party. If you're interested and ready to accept this challenge, please email me at Jagrutiscookingodyssey1971@gmail.com so I can arrange a group and we can start the challenge in April. Use of logo and link this challenge announcement page both times in your post is MUST. Let's get ready to have fun and challenge ..waiting for your emails . Please send me an email, so I can send you further details ! Please send me an email, so I can send you further details. The idea is too good and am very much interested in it. So count me too, I have already sent you a mail . Hope you recieved it. Excitedly waiting for further details. Nayna, I haven't had any email from you. Please send me again, so I can send you further details. Really an interesting event. Can I join now? Yes, you can. Send me an email and will give you all the details. can i join in this interesting event?wat to do? Of course you can Ramya, please send me an email, will give you further details there. Thnx ! Hi ,an interesting event jagruti...is there a way in which I can participate now or is it too late ?? Priya, yes you can join.. send me an email and will give you further details to you. Hi Jagruti,I have sent you email to participate,please count me in. Hey Jagruti, I have sent an email, let me know if I can participate now. Interesting can you add me?